Bootcamp, Spin and Yoga Classes now available. Intermediate to advanced level - Boot Camp class often commences with dynamic stretching and cardio, followed by a wide variety of interval training, including weight training, TRX, body weight exercises, small apparatus exercises, plyometrics, and various types of cross training routines. Set up in a circuit format this will be cross training, cardio, and core all worked into one dynamic workout. Intermediate to advanced levels - This class included body weight exercises and using the TRX straps in which a variety of multi-planar, compound exercise movements can be performed. Intermediate to advanced levels – This is similar to our bootcamp class with almost the resistance training component coming from TRX. This class will also incorporate small apparatus exercises, plyometrics, core, and cardio training. Intermediate to advanced level - Spin Class is going to be a cardio blast with great music and an enthusiastic teacher to walk you through the ride. All of our classes are on Keiser m3i spin bikes that are famous for their rear wheel magnetic ride system. Features include a lever to modify the difficulty of pedalling, specially shaped handlebars, and multiple adjustment points to fit the bicycle to a range of riders. The Keiser pilot allows you to get instant feedback on your numbers as you ride. 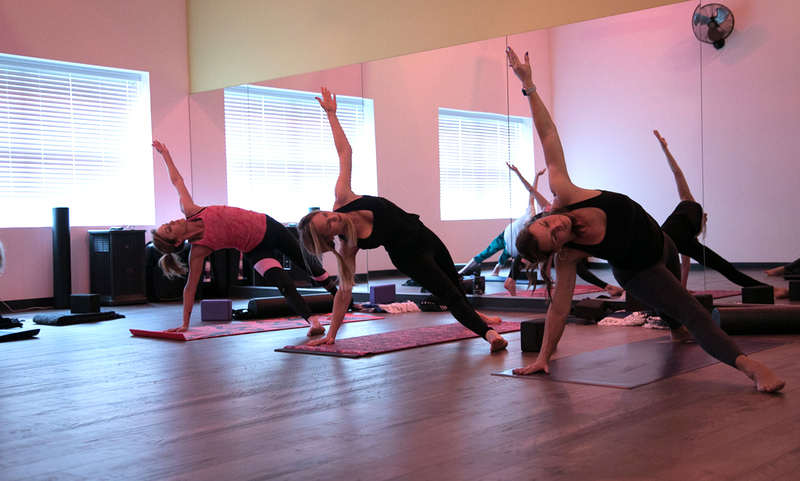 All levels – Vinyasa is going to be an active yoga practice that will flow through various poses of vinyasa in order to explore your body’s flexibility and stability. This class is designed so that all levels can practice together in a safe space. Exploration of various poses gives students an opportunity to develop greater awareness, balance and strength. All levels - Yin Yoga invites you to slow down and create space for stillness while nourishing joints, ligaments, tendons and fascia. Yin is yoga at its coolest, deepest, quietest, stillest moments. This class will have you on the floor most of the time, using as many props needed to create as little effort while holding poses. Poses are held for 2-5 minutes allowing joints and fascia to release. This class will complement your Vinyasa practice and will open and release areas in need of more stretching. All levels - This class is suitable for all levels. Flexibility training is a staple for a well-balanced body. This Mobility Class is foam rolling, static stretch, dynamic movements, and yoga fused together for a 50 minute mobility class. The goal of this class is to improve functional and dynamic mobility of all different joints of your body.